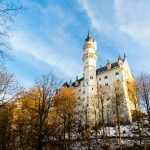 In anticipation for our trip to Munich later in the year, we asked a few fellow travel bloggers for their tips with regards to the best things to do in Munich with kids. More importantly, given we will be in Munich during December we wanted tips on the best things to do in winter. 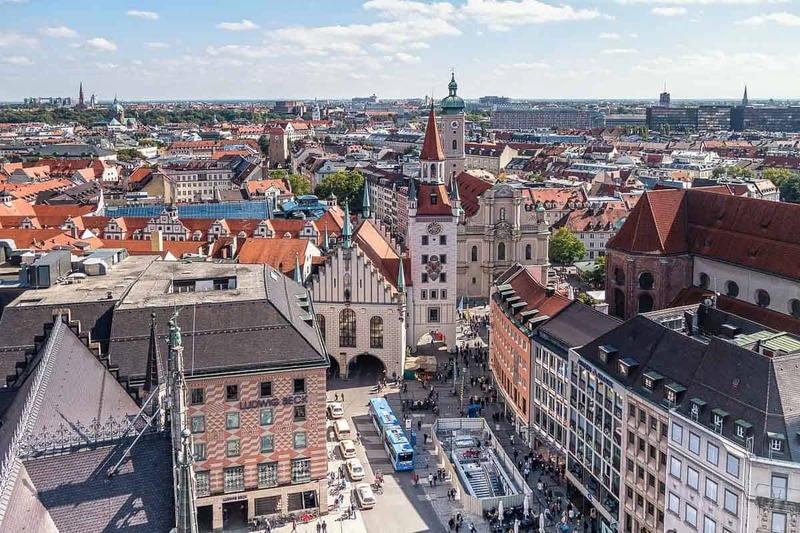 We are spending a week in Munich so have plenty of time to explore all the best things to do in Munich with family as well as take a few of the best day trips from Munich. If you are looking for things to do in Munich in December as well as some tips on things to see around Munich, keep reading below. 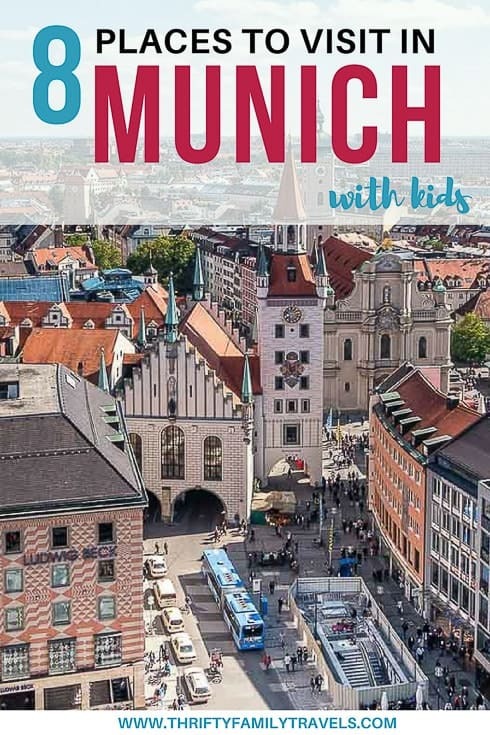 Click here to read our Ultimate Guide to Munich with Kids – includes best Munich attractions, where to stay and how to get around. Thanks to Christine from Tapped Out Travellers. Hofbräuhaus was founded in 1589 by the Duke of Bavaria, Wilhelm V and it is one of Munich’s oldest beer halls. 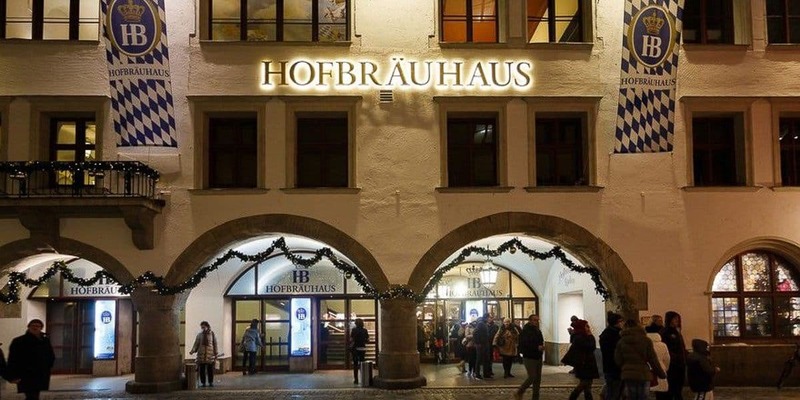 After World War II, thanks in part to the legions of American soldiers stationed in Munich bringing home beer mugs with the “HB” logo, the Hofbräuhaus quickly became Munich’s number one tourist attraction and remains one of the best places to go in Munich. Reservations are available for tables inside the hall, but biergarten tables are not available for reservations so be sure to show up early and expect to wait. The Hofbräuhaus is family friendly, in that they allow children. There isn’t much room for strollers and they don’t carry a children’s menu, but this is true of many of Germany’s older restaurants and tourist attractions. From Marianplatz, simply walk 350m to reach Hofbräuhaus. It is across the street from the Hard Rock Café and Star bucks. Don’t forget to look around the local souvenir shops, as well as the shop inside the Bier Haus, there are plenty of unique items to be had here. Hofbräuhaus is open from 9am – 11:30pm. One of the best things to do in Munich in December is to visit the Christmas Market in Marienplatz. 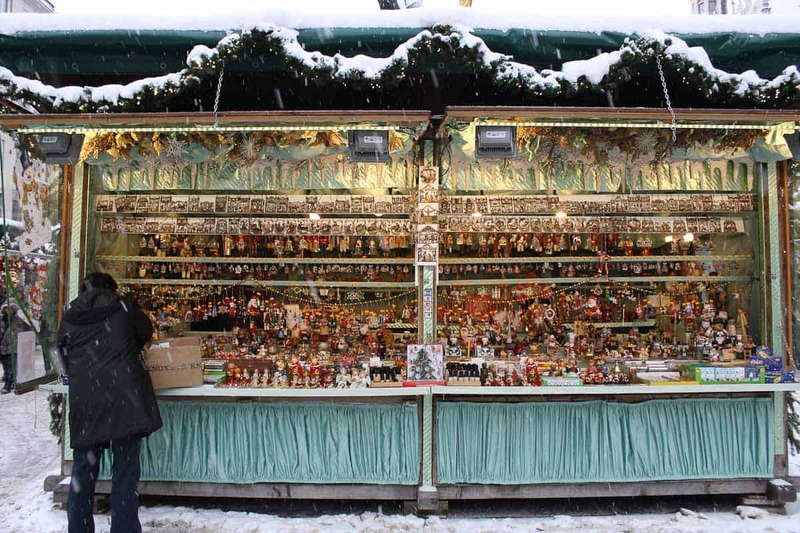 Covering an area of over 20,000 m2, the Munich Christmas Market hosts more than 160 stalls selling everything from Christmas ornaments and decorations to culinary delights. The Munich Christmas Market dates back to the 14thcentury and it still retains its Bavarian traditions today. Amongst the products you’ll see on sale are hand painted glass baubles, sheepskin jackets, gingerbread and mulled wine. Whilst the Munich Christmas Market is one of the city’s tourist attractions it is also popular with locals. Residents flock to the market to catch up with friends, chatting over a snack of roasted chestnuts and a warm drink or herb liqueur. One of the features of Munich’s Christmas Market is the huge Christmas tree that stands in the square in front of the New Town Hall. Around 2,500 candles – and live Christmas music performances on the from the Town Hall’s balcony each day from 5.30pm – add to the festive atmosphere. Kids will love visiting the market, too. Amongst the activities they can enjoy are ice skating and paper making workshops. They can also hand in their Christmas letter at the Christkindl Post Office at the New Town Hall (in the Prunkhof) and have it stamped with a white angel that personally delivers their mail to St. Nicholas himself. It opens 1st of December to the 10th of December daily from 12pm – 6pm. The Munich Christmas Market in Marienplatz is open from 10am to 9pm daily (Sundays until 8pm) from Monday, 26th of November to Monday, 24th of December, 2018 (2pm closure). 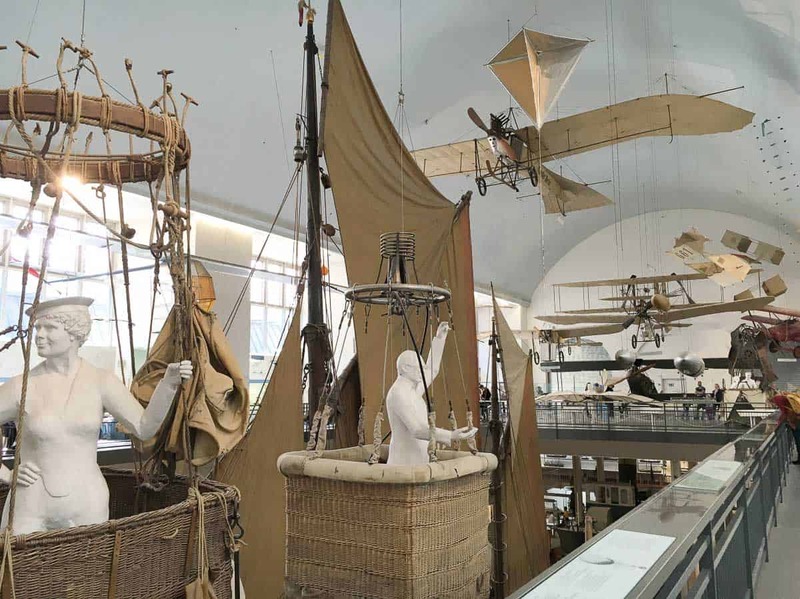 The Deutsches Museum in Munich is one of the world’s largest and oldest science and technology museums and one of the best places to visit in Munich. There are over 30 exhibitions featuring information about space, aviation, computers, energy and electricity, our oceans and the history of medicine. An absolute highlight if you’re visiting with children is the Kids Kingdom section – jam packed full of fun activities that will keep everyone occupied for hours. Our kids loved playing in the giant guitar, building a ball rolling track, giant building blocks, the wonderful hall of mirrors, and arts and crafts. We also really enjoyed visiting the aeronautics hall to learn about the history of flight – including the only surviving example of one of the Wright Brothers’ planes. The space and astronomy section is also fascinating with a planetarium, solar telescope and sun dials. The Deutsches Museum is open daily from 9am to 5pm (except public holidays). Adults are € 12, Children 6 to 17 are € 4, and under 6’s are free. A family ticket for 2 adults and their children is € 25. Getting to the Deutsches Museum is very easy, with public transport connections by bus, tram, S-Bahn and U-Bahn. Thanks to Rashmi and Chalukya from GOBeyondBounds. The Nymphenburg Palace is a Baroque palace in Munich which served as the summer residence of the Bavarian rulers. 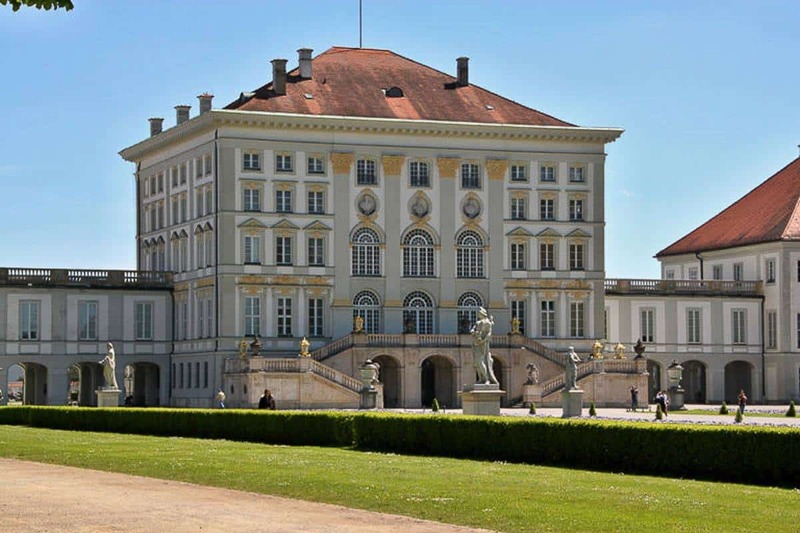 The palace originally a mansion of Wittelsbach family was expanded over time into a magnificent palace surrounded by a beautiful landscaped baroque gardens. The tour of the palace walks through the Grand Hall, the royal apartments, and rooms which are decorated with frescoes and numerous artworks. There are 2 museums part of the palace tour which is housed in the pavilions outside the main palace building – MarstallMuseum (Chariot Museum) and Nymphenburg Porcelain Museum. MarstallMuseum displays ornate carriages used by the royal family including King Ludwig II. The Porcelain Museum displays a wonderful collection comprising of tea sets, table centerpieces and dinner sets from the 18th to the 20th centuries. Do not miss the palace gardens which has numerous small baroque palaces, pavilions, fountains, and sculptures. The palace is about half an hour ride away from the city center of Munich. There are direct trams from the main square Karlsplatz. Alternatively take a U-Bahn (underground train) to Rotkreuzplatz, then tram to Schloss Nymphenburg. There are two types of tickets. The combination tickets which includes the palace, the Marstall-museum and Porcelain Museums and the garden palaces. The prices are 11.50 euros from 1st of April – 15th of October and 8.50 euros from 16th of October – 31st of March. If you are planning to visit the individual attractions the prices are 6 euros for Nymphenburg Palace, 4.50 euros for Marstall-museum with Museum of Nymphenburg Porcelain and 4.50 euros for the Park Palaces. The park palaces are closed in winter from October to March. The Olympiapark/Olympic Park is one of the most impressive and popular places in Munich. 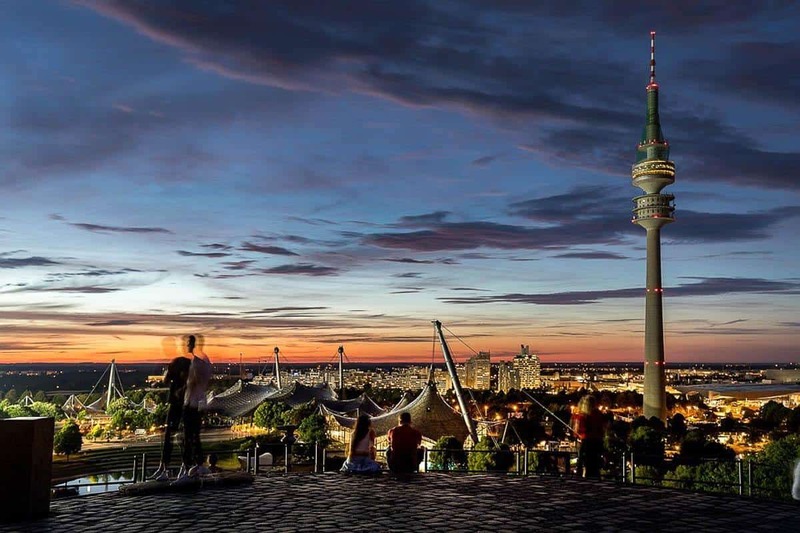 Designed for the 1972 Olympic Games, some of the important buildings in the Bavarian state capital could be found here: the Olympic Stadium, the Olympic Hall and the Olympic Tower. In addition, the extensive park offers various leisure activities and at some points a venue for concerts, local and international events, festivals and a variety of sports activities. There’s live public showing of certain sport tournaments such as FIFA and the Olympic games. Visiting the park in winter would mean seeing the city covered in snow, do go up the observation desk of the tower. You can also try the flying fox – a kind of zip-lining through the stadium, or boating through the lake, which may be cold enough in the winter season. The park closes two weeks in December but is open the whole year through on different hours, better check their site to see which time is best for you. The Olympiapark can be easily reached by train lines and several buses and tram lines. Interestingly if you decide to get off the U3-line Olympiazentrum station, the BMW Welt (in extension the BMW Museum) is the first impressive building you’ll see. If you are a car enthusiast, it would be a delight to visit the BMW Welt along with the museum. The BMW Welt per se is free to visitors, they showcase the current BMW line ups and also Mini and Rolls Royce’s newest models. The museum showcases old BMW models, cars, bikes, and other BMW historic vehicles…if you are not a car lover, you will definitely become one after spending two hours here. Museum fee is €10. Thanks to Cate from International Desserts Blog. 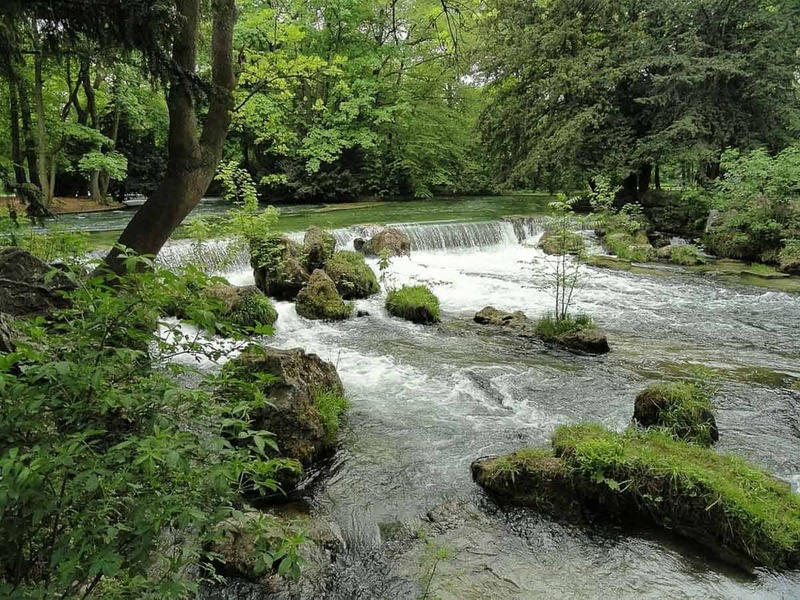 The Englischer Garten is one of the best attractions in Munich! One of the world’s largest urban parks (larger than NYC’s Central Park), there’s so much to do in any season of the year. The Englisher Garten is divided into two sections; most people visit the smaller southern section (if you’re looking for lots of peace, quiet, and locals, head to the northern section). How to spend your time in the Englisher Garten? Here are a few ideas: take a stroll, jog or bike ride on one of the many paths and trails, grab a beer at a Biergarten (the largest is next to the Chinese Tower and there’s one near a playground in the northern part of the park), experience a tea ceremony at the Japanese tea house, watch surfers surf the natural rapid created by the river that flows through the Englisher Garten (it’s mesmerizing! ), sunbath in the buff in the Schönfeldwiese, see the 25-meter tall Chinesischer Turm (“Chinese Tower”), rent a paddleboat at the Kleinhesseloher Lake, and more! You could easily spend several hours to an entire day exploring all that the Englisher Garten has to offer. No matter the season, it’s a beautiful, calming site in the heart of Munich. Thanks to Leanna from Well Travelled Nebraskan. Munich is the perfect place if you are looking for culture and glimpse into local life. However, one of the best places in Munich to visit is actually not IN Munich at all. Instead, it is just a short and easy, 45 minute S-Bahn and Bus ride to the first concentration camp in Germany; Dachau. Nothing can prepare you as you step inside the concentration camp, including barracks, crematorium and gas chambers. 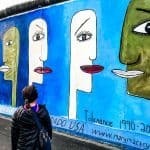 However, it is an experience anyone traveling to Germany should go through. It is not only humbling to walk on the same paths that so many people who were murdered once walked on, but also a stark reminder of how we can not let hatred, bigotry and racism to overcome us ever again. Many people wonder if they should bring their children to Dachau and I remind them that it is a mandatory school “field trip” for Germans today as a reminder to never forget history. To teach our kids that this kind of atrocity can never happen again is powerful, even if it is a tough lesson to instill on delicate minds. 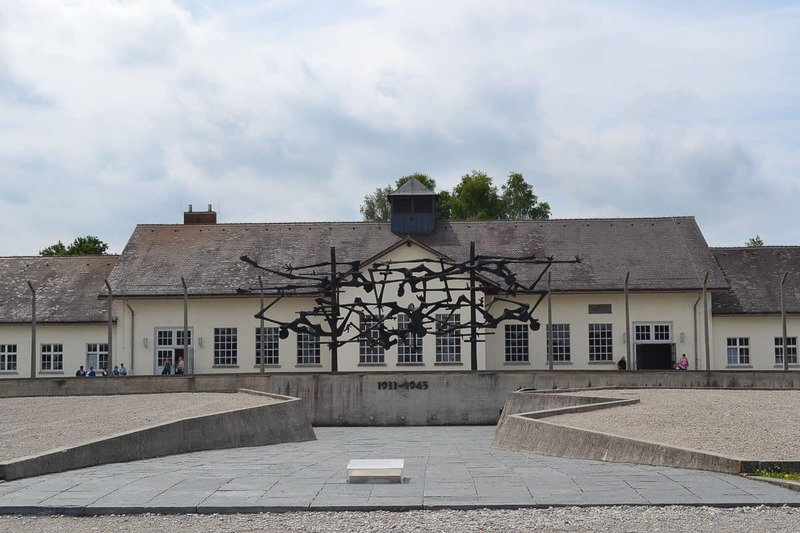 Even with just an afternoon to spare while in Munich, it is easy to access the Dachau Concentration camp and is a powerful and emotional part of your travels that you are sure to never forget. Click here if you wish to book a tour which includes entry and transfers. Thanks to Christine from Christine Abroad. If you need a break from the big city pulse of Munich, then I can highly recommend you to visit Lake Eibsee. Lake Eibsee is one of the most beautiful lakes in Germany, and in my opinion, one of the most beautiful in the world. This emerald-green colored crystal clear lake is located around 1.5 hour from Munich by car, but can also be reached by public transport. Next to the lake there are plenty of parking lots where it costs 4 euros for a whole day. The loop trail of Eibsee is 7.5 km long and is known to be one of the most scenic walks in Bavaria. Along this trail hikers can enjoy amazing views of the emerald waters, lush nature, and backdrop of Zugspitze, which is the highest mountain in Germany. One of my best tips is to visit the lake during the morning, when the water is calm and the light is magical – especially if you’re interested in photography. Thanks to Shandos Cleaver from Travelnuity. 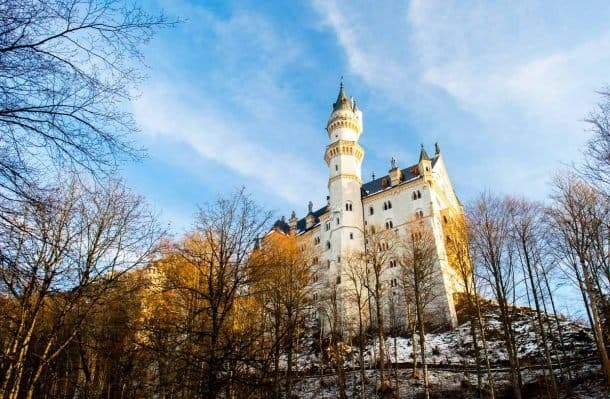 No matter what time of the year, one of the top things to do in Munich is to head to Neuschwanstein Castle on a day trip. Even if you haven’t heard of its name before, you’ve probably seen photos of it – the fairy-tale castle that inspired the Disney castle. In summertime, it’s possible to swim in the nearby lake, while in wintertime cross your fingers for a magical dusting of snow. While it’s possible to take a bus tour to the castle, the cheapest and most flexible way to visit is by taking a train from Munich. The trains are comfortable and reliable, and when the train terminates at the other end, follow everyone else getting on the bus (which is included in the cost of the Bavaria Ticket you’ll buy for the train). If visiting during peak season, be sure to buy your tickets at least 2 days in advance online. However, when we visited in wintertime, it was fine to just queue up at the ticket office. To get to the castle from the ticket office, it’s either a 1.5km walk up the hill, or else a shuttle bus or horse-and-cart rides are available. Make sure you’re on time for your tour – it starts exactly on time – and don’t miss getting an amazing photo from Marienbrücke. Tickets: €13 per adult, children under 18 free, with a €1.80 service charge per person when bought online. Opening Hours: 8:30 am to 3 pm in wintertime, 7:30 am to 5 pm in summertime. 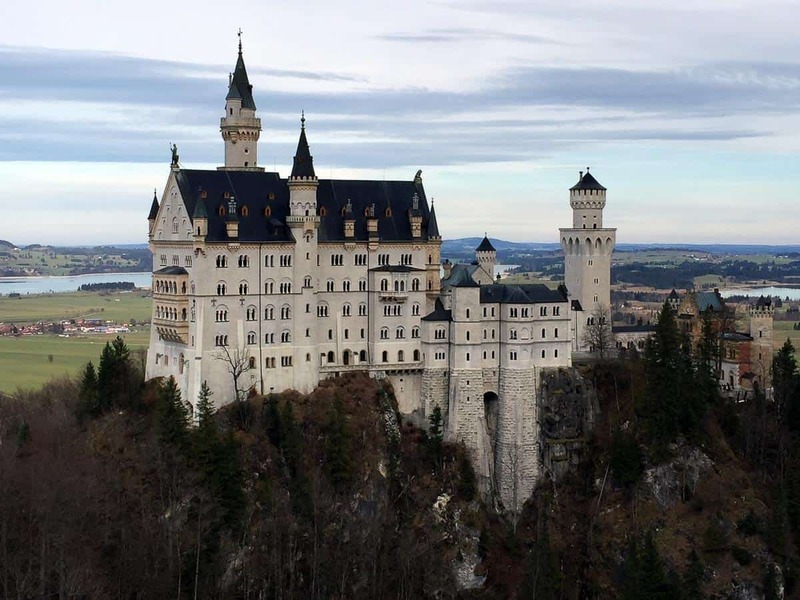 Click here for information about joining a bus tour to see the stunning Neuschwanstein Castle. 1. 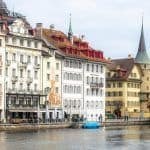 Day trip to Salzburg in Austria: If your trip to Germany doesn’t include a side trip to Austria, you can take a day trip across the border to Salzburg. You will travel through the Bavarian Alps where “The Sound of Music” was filmed as well as a take a cruise across Lake Wolfgangsee. There is also time to explore the old city of Salzburg. Click here for more information or to book the tour. 2. 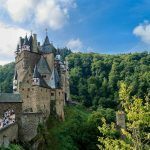 Day trip to Rothenburg and Harburg: This tour takes you on a guided tour of Harburg Castle as well as to the medieval town of Rothenburg ob der Tauber and along the Romantic Road one of the Germany’s most popular tourist destination due to its stunning scenery. 3. 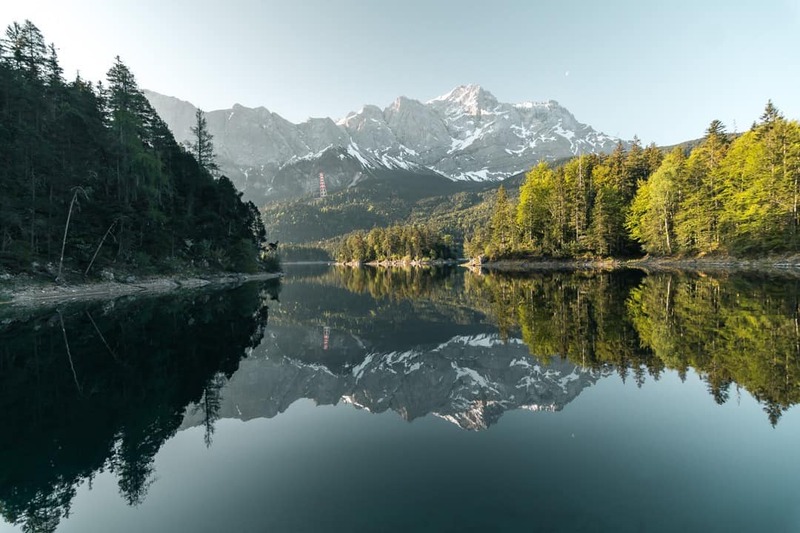 Day trip to Berchtesgaden and Eagle’s Nest: On this tour you visit the stunning Bavarian Alps, visit the NS-Documentation Centre (a memorial site to victims of the Nazi party in World War II) and Eagle’s Nest – Adolf Hitler’s infamous mountaintop estate. 4. Day trip to Nuremberg Day Trip: This tour is one for history buffs as you visit not only the NS Documentation Centre but also the Nazi Party Rallie Ground as well as a guided tour of the town of Nuremberg, once considered the capital city of the Third Reich. 5. Hop-On Hop-Off City Tour: I love these sorts of tours as a quick and easy way to not only get around the city but also to learn a bit about it as you go. 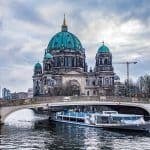 The bus route includes Hauptbahnhof – Central Station, Kunstareal, Odeonsplatz, Icewave, Max-Joseph-Platz – Opera, Marienplatz – City Hall, Karlsplatz – Stachus, Nymphenburg Palace, BMW World & Museum, Olympic grounds, Schwabing / Siegestor / English Garden and Deutsches Museum. If you need even more tips, click here for 50 great day trips from Munich. Looking for accommodation in Munich, click here to see what is available.